I met Micke yesterday after getting lost in Stockholm (a strange experience). It was a pleasure to talk to him. I had to ask again about why he calls his exhibition (now on show at galleri ikon) a banal Greek exhibit and I got the same answer as in the interview published here on 591; " It is not too serious, just for fun, they are pictures captured with a compact digital camera." 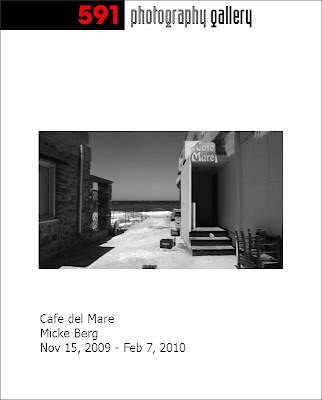 Micke Berg also said in the interview; "I am looking for a different form, more meditative, but I hope that my pictures will still hold a good quality"
To me Cafe del Mare is a part of his search for another expression. 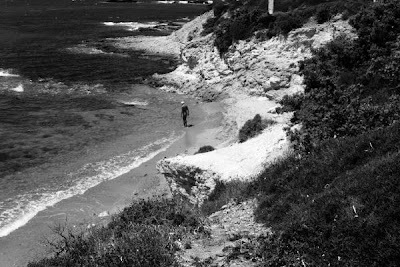 The single picture that touch me the most is the one of a boy looking for cover from the harsh light. He is lying down wearing a striped towel. 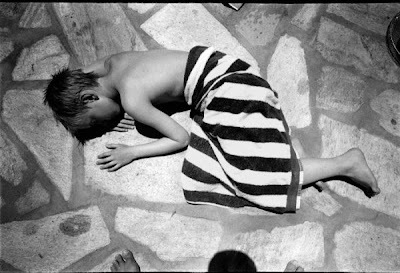 Micke Berg stands out as one of the most interesting Swedish photographers of his generation. His new book about Stockholm is a treasure. I've been looking forward to this exhibition ever since the interview and I was not disappointed! I appreciated so much the gallery. 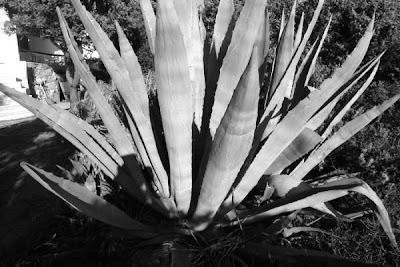 It has a good taste of 50's and the exotic experience of southern Mediterraneo islands of those years.